Whether you need just a few more shelves to put things on or you want a completely new closet built, we can create exactly what you want. Our expert craftsman can design either a free-standing wardrobe or create a closet built into the wall. No matter what you need to store and no matter how big you need it to be, Raven’s Craft will create a beautiful and practical closet for you. If you have a small room, a custom wardrobe is perfect to add more storage. 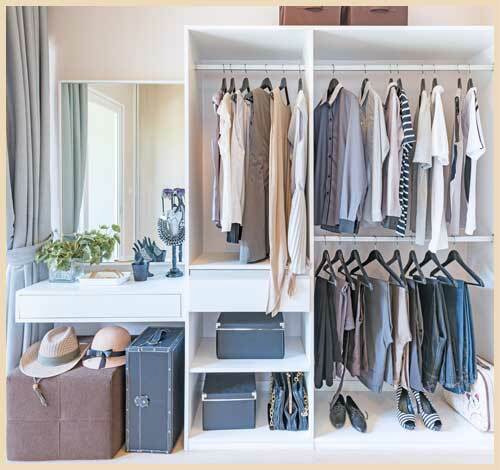 We can create wardrobes with drawers, doors, and plenty of hanging room to take advantage of all of the available space. We will take your space’s exact measurements before creating the perfect piece that will look right at home in your room. Contact us today for more information. When the expert craftsman at Raven’s Craft begins to design your custom closet, we invite you to be a part of the process. Tell us exactly what you will be using the closet for and we can design something beautiful for you. Style what the outside looks like by choosing door styles and inlays, and choosing a color of paint or stain. For the inside, we can create the exact amount of storage you need. From drawers to hanging bars, to cabinets, and more, Raven’s Craft can design and build exactly what you need.